The silly and active Bull Terrier temperament makes him your family clown. However, this strong-willed terrier is not the best match for every household. Although the breed looks imposing, the sweet-tempered the Bull Terrier temperament is that of an active and rowdy goofball. He adores being with his family and is extremely energetic, especially in short bursts. He can also be a very sweet and affectionate pet and needs plenty of companionship. Understanding the Bull Terrier Temperament is one of the first independent steps you can take to gain a good appreciation of the Bull Terrrier's behavior and tendencies. The following are some of the temperament traits and personality to be on the lookout for. The Bull Terrier breed was developed to hunt vermin and to fight, the Bull Terrier personality needed to be courageous and determined. Bull Terriers are also independent thinkers. They are sometimes stubborn or difficult to train. Because of this, Bull Terriers do best with dog owners who have some prior training experience. Bull Terriers are intelligent, but they do not blindly follow orders. You need to be calm and assertive in the face of his attempts to take over. You will need to train your Bull Terrier using high-value rewards. As an example, food and special treats can help here. If you do not have the time and patience to work with your Bull Terrier it's best to select a less demanding breed, such as a Lab or Golden Retriever. The Bull Terrier was bred to fight, and some individuals (but not all) will be very keen to argue with other animals. This type of dog temperament means that your Bull Terrier may need to be the only dog in your household. An un-neutered male is very likely to attack another male dog. This is one important reason to spay/neuter your Bull Terrier. A male and a female may live together peacefully, as can two females. However, to avoid this dog on dog aggression, whenever your Bull Terrier is in the company of any other dog, your Bull Terrier must be closely supervised. Socialization can make a difference to how well your Bull Terrier interacts with others. Sign up for a socialization class at the earliest opportunity. Even if your dog has been raised with other dogs, and is relaxed in their company, he is still very likely to react to a perceived threat from another dog. If you decide to share your life with a Bull Terrier, you must learn to interpret his body language. By doing this, you'll be able to tell when he is uncomfortable around other animals before he has the opportunity to do harm. This breed has a very strong prey drive, and if he catches that prey, he will cause serious injury. Generally speaking, the Bull Terrier usually is not a good choice of dog to share a home with cats or other small creatures, although there are some exceptions to this rule. If your Bull Terrier is not comfortable around other animals, you can take some extra precautions to make sure that everyone stays safe. Always walk your dog on a short leash and keep him under control. Never walk him off leash or on a flexi leash. If you worried about other dogs approaching your dog on walks, you can walk your dog with a basket muzzle.Or you can carry citronella spray to ward off approaching dogs. The Bull Terrier can be extremely territorial and protective of his family, particularly when strangers are about. The keen Bull Terrier temperament makes him an excellent watchdog. Even if he is not aggressive towards people, his impressive demeanor will deter any unwelcome visitors. Some Bull Terriers can become overprotective and neurotic. This is particularly true if you do not socialize them enough when young. This can also occur in those dogs that are bred from dogs with suspect temperaments. Without exposure to all sorts of people and places as they are growing up, they can become nervous around unfamiliar people, and they may bite out of self-defense. To avoid the above I recommend that you ask many questions about temperament from the breeder or shelter before you bring a new dog home. 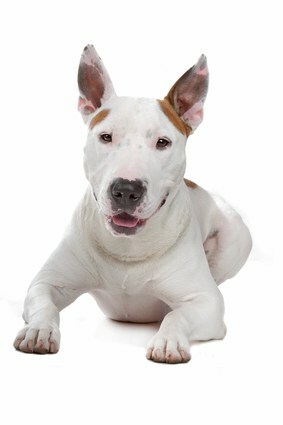 Most shelters will conduct a dog temperament test before you bring home a Bull Terrier from a shelter. If the shelter does not conduct its own behavior evaluations, you can hire a professional positive reinforcement trainer to conduct a test on your prospective dog before you bring it home. That way you know what you are getting and can decide if you are up to the training task to correct any negative Bull Terrier temperaments. Here is a guideline to conducting a temperament test: “5 Tips For Conducting A Dog Temperament Test Before You Adopt From Shelter”. However, please remember that this test should only be performed by trained professionals. One of the nicest parts of the Bull Terrier temperament is how much he loves to play and act the clown. 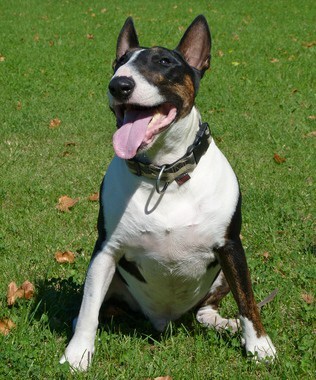 Bull Terriers make great companions for outdoor exercise. However, you will need to be watchful – some Bull Terriers can be a bit rough during play, and need to be taught to settle down. Most Bull Terriers will put up with a lot of attention from children but can knock them over, purely because they are so rambunctious and enthusiastic. This means that he isn't well suited to a home with young children or older people. The Bull Terrier originated in Britain. These dogs were originally bred for blood sports such as bull baiting and dog fighting. They were created by crossing muscular bulldog type dogs with quick and agile terrier breeds. When blood sports were outlawed in England in the 1830s, Bull Terriers became popular pets among fashionable society. A man named James Hinks is credited with standardizing the modern Bull Terrier dogs. The American Kennel Club inducted the breed in 1885, and Bull Terriers are prevalent in American popular culture to this day. It is important to train your Bull Terrier to help him or her become a well-mannered canine citizen. If possible, sign up for a positive reinforcement obedience class with a professional dog trainer. Make sure the trainer uses force-free methods. Bull Terriers are smart and they respond well to positive training methods. Positive reinforcement is the safest and most effective form of training. Never use harsh punishments or painful equipment such as shock collars or pinch collars. These tactics are not necessary and will damage your relationship with your dog. Keep training sessions short, fun and variable. If you are running into behavioral issues, seek assistance from a professional positive reinforcement obedience trainer. Once you and your dog master the basics, you can explore more advanced classes such as agility, rally obedience, or canine good citizen. Bull Terrier howling is an occasional behavioral challenge for Bull Terrier owners. Increasing exercise and enrichment will usually solve the problem, but if the behavior persists seek advice from a professional trainer. Average Bull Terrier weight is between 50 and 70 lbs. The Bull Terrier head is its most distinctive feature. Bull Terriers are famous for their “cone-shaped” heads. Bull Terrier colors come in two categories: white and colored. You acn see the varieties are shown separately in dog shows. 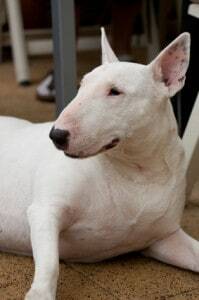 White Bull Terriers are pure white. Colored Bull Terriers can be any color other than white, but the preferred color is brindle. The colors blue and black and white are also popular. The Bull Terrier coat is short and easy to maintain. This dog requires very little grooming. Brush and check your Bull terrier teeth periodically and trim nails when needed. Your Bull Terrier should visit the veterinarian once per year for an annual wellness checkup and vaccinations. For example, check your Bull Terrier eyes annually. Your Bull Terrier should be on a monthly heartworm preventative at all times. Spaying and neutering are highly recommended for a variety of health and behavioral reasons, as well as to avoid exacerbating the animal overpopulation crisis in America. With high-quality care, the average bull terrier life expectancy is between 12 and 13 years. However, Bull Terrier lifespan varies from dog to dog. Note: if you agree that your health and your dog's health should be a top priority then get a copy of The Ultimate Guide to Dog Health. Your Bull Terrier friend will love you for it. This guide will help save you money, time and most of all help you keep your dog healthy. Bull Terriers are prone to an odd behavior called trancing. Trancing is a behavior in which the dog creeps very slowly while something (like a plant) lightly touches its back. Nobody knows why dogs do this or why certain breeds (such as Bull Terriers, Greyhounds and Salukis) are more prone to Trancing. Ghost Walking or Weed Walking are other names for Trancing. Regardless, this behavior is not dangerous and should not be a cause for alarm. If you feel you are ready to add a Bull Terrier to your family, please check out local Bull Terrier rescue groups and adoption societies before Bull Terrier breeders. There are many purebred Bull Terriers as well as Bull Terrier mixes looking for loving homes. For your first step, pay a visit to your local animal shelter or humane society. Let the staff know that you are looking for an adoptable Bull Terrier and ask them to call you if one becomes available. You can also search online through websites such as Petfinder.com, Adoptapet.com and Getyourpet.com. Facebook is another great resource for Bull Terrier rescue groups. The Bull Terrier Club of America also maintains a rescue page with excellent links and resources for adopting a Bull Terrier that needs a loving home. Most of these dogs are looking for new homes through no fault of their own. Many lose their homes when their owners go through a financial crisis, personal upheaval or housing difficulties. Many of the Bull Terriers in rescue are already housebroken and have some prior training. When you adopt a Bull Terrier through a rescue organization, the Bull Terrier cost is usually between $75 and $200 depending on the organization. Bull Terriers from these sources are almost always vetted, spayed/neutered, vaccinated and microchipped prior to adoption. If you decide to work with a breeder, do your research to make sure that your Bull Terrier puppy comes from a reputable breeder. Never purchase Bull Terrier puppies online or from a pet store. Always visit the breeder in person to check out the way the animals are housed and handled. Ask to see proof of veterinary care, vaccine records, and genetic testing. The Bull Terrier Club of America has a breeder referral list on their website. However, prospective buyers are still encouraged to do their own research into these breeders. The BTCA states that “These names represent breeders who at the time their names were placed here were members in good standing of the Club. If you purchase a Bull Terrier for sale through a high-quality breeder, the Bull Terrier price will likely be over $1,000. Some bloodlines will be closer to $5,000, making this breed one of the most expensive breeds to purchase from a breeder. The playful, fun-loving yet protective Bull Terrier temperament makes this breed a popular pet. Admirers of the breed adore the Bull Terrier’s cute and cocky personality, but it is important to do your research to make sure the Bull Terrier characteristics will fit your lifestyle. To prevent behavioral problems in this breed, and to make sure you are happy with your canine companion, think carefully before you choose a Bull Terrier, and make sure you are confident and experienced enough handle and train this breed. If you are unsure, then choose another breed; you'll be much happier with your canine companion. The strong Bull Terrier temperament will only cause you stress and anxiety. Next post: Is The Havanese Temperament (Playful, Smart, Affectionate) What You’re Looking For?